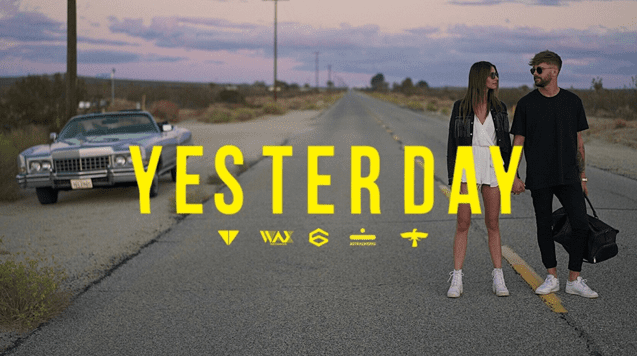 14 December 2018 (TORONTO, ON) — Indie-pop singer/songwriter Virginia to Vegas has released the video for his catchy single, “Yesterday.” Watch it HERE. The video was directed by the artist, whose real name is Derik Baker, along with his longtime creative director Justin Alexis (That Good Graphic), and takes viewers on the journey of a short-lived romance. Shot on-location in Los Angeles, the video takes advantage of the deserts’ natural beauty and features sweeping shots of the dramatic desert sunset that serves as a backdrop to the recounting of the failed love story. Released as a single in October, “Yesterday” quickly became a fan favourite and continues to climb radio charts. Recognized as a fitting example of tomorrow’s global pop star, Virginia to Vegas cut his teeth in the music industry writing songs for a variety of pop artists and showcasing originals on YouTube. Hailing from Richmond, Virginia, Baker combines indie-pop choruses with sticky electronic melodies, garnering him over 60 million streams worldwide and 3 platinum selling singles. Further, Baker has continued to make a mark for himself as a writer, co-writing and producing Blackbear’s hit single “IDWK." Not one to rest on his laurels, Virginia to Vegas continues to innovate and elevate his sound as he expands his reach internationally via a new partnership with Astralwerks.